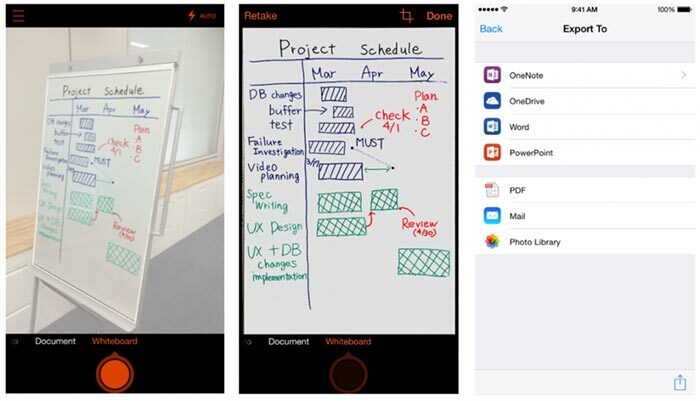 Microsoft has brought its Office Lens smartphone app to both iOS and Android platforms. The handy document imaging utility was first introduced on Windows Phones just over a year ago. The Office Lens app makes use of your smartphone camera to capture documents and then processes them and OCR them to make their contents searchable. If your framing of the image isn't so good, for some reason or other, Office Lens intelligently fixes this for you as it recognises the document corners. It is thought that the utility will be useful for users who like to keep an array of records including receipts, business cards, menus, whiteboards or sticky notes. For business cards it is smart enough to know to file these entries into your contacts address book, for example. Once you have captured the image and it has been processed you can save it to OneNote and/or OneDrive for access across all your devices and easy sharing. The images are searchable via keywords and phrases thanks to the OCR built-into the app. You can choose to convert the images into Word documents, PowerPoint presentations and PDF files as you wish. Office Lens is a well regarded application for Windows Phones with an average rating of 4.6 stars (out of 5) from more than 18,500 reviews. The Apple iOS version is now available via the Apple App Store. However the Android version is available in preview only. To get this version you must join the Office Lens Android Preview Google+ community and choose the option to 'become a tester'. I can't find it on the google play app store. Oh well, should show up sometime.